The book under review is a story of how a country ravaged by civil war for decades and racked by genocide under the authoritarian regime of Pol Pot was rescued from years of famine by a project set up by funds from Australia and administered by scientists from the International Rice Research Institute (irri), Manila. 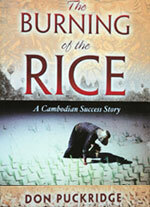 Don Puckridge's The Burning of the Rice is the story of how Cambodia was rescued from hunger by a handful of agricultural scientists, who survived Pol Pot's insane purges of intellectuals, to later train in countries like Russia and eastern Europe and France, to work with scientists from irri, mostly Indians and Americans, to turn the famine-stricken country into a self-sufficient producer of rice in just 16 years. But this is not just a story of agriculture and agricultural science -- the strength of the book is that it is a story about people: about people who suffered at the hands of Pol Pot's brutal regime and the ravages of decades of civil war: about people who had the fortitude to survive these; and about people -- mainly scientists -- who risked lives to go right into the war zone to rescue a country. On the agricultural front, Puckridge tells the story of how Pol Pot, in his attempt to create a kind of primitive communist utopia, virtually depopulated Camdev Khush, who guided Cambodians like Chan Phaloeun, Men Sarom and Ngak Chhay Heng. Then, there are some incredible stories. For instance, there is the story about Vo-Tong Xuan. Vo-Tong was an agricultural scientist whose parents had been killed by Pol Pot's militias. Despite that, or perhaps because of it, moved by Cambodia's plight, Vo-Tong became the man behind Cambodia's revival. Since Vietnam was not in a position to help Cambodia, Vo-Tong approached irri to step in. It was only after that that the Australian-funded irri project was initiated. Stories like this light up the book. Despite being an agricultural scientist, Puckridge manages to make a story that is essentially about agricultural science, sound almost like a work of fiction. He succeeds in doing this because he does not go into the arcana of agricultural science, instead enlivening the narrative with a wide range of anecdotes from the field -- being intimately involved with the project, he makes these stories bring a deep authenticity to the narrative. The authenticity of the narrative is further bolstered by Puckridge's simple but vivid description of the countryside, its people and the lives they lead. Traditionally, Cambodians burned rice as a sacrifice to the Buddha in years in which they got a good harvest. After many decades, in 2002, Cambodians once again burned rice. But that's not all -- the most heartening thing about this symbol of burnt grain is that the project that ensures there is grain to be burned is not administered by irri anymore. It's run by the Cambodian Agricultural Research and Development Institute. Not bad for a country that had just about half-a-dozen agricultural scientists not that long ago.